Adding a newly licensed 16-year-old (or even younger with a learner’s permit) to your car insurance policy comes with mixed emotions for most parents. One one hand, your child has the independence to now drive themselves to school, practice, or to the movies, but on the other hand, the anxiety of having them behind the wheel is stressful. 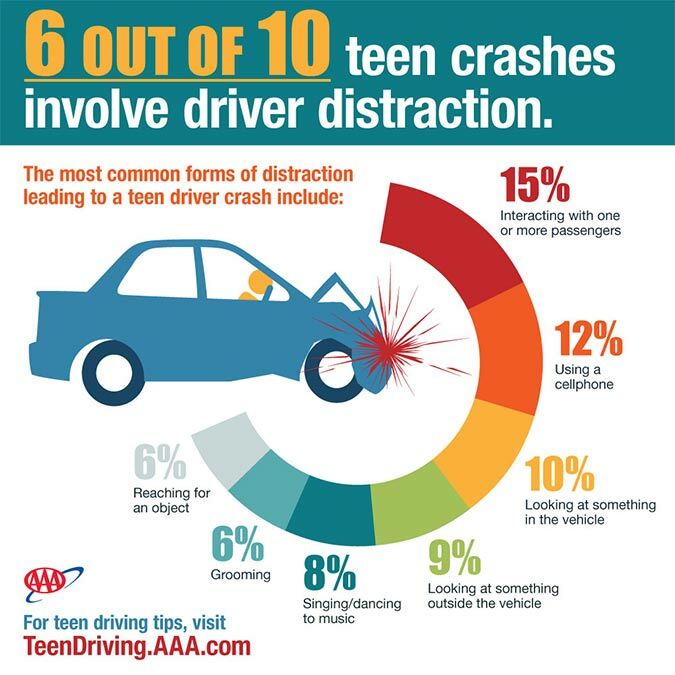 Teen drivers are much more likely to be involved in a car accident due to both inexperience and distractions. The radio, cell phone, friends, and no fear factor all contribute to increased accidents and more expensive auto insurance bills. The diagram below shows why distracted teenagers give their parents gray hair. The big question on most parent’s mind when the time comes to add junior to the policy is ‘How much is it going to cost?‘. 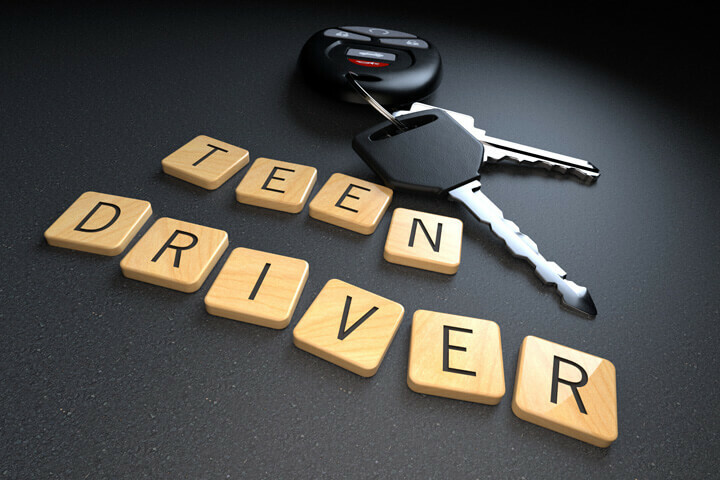 There are a lot of factors that contribute to the added cost of having a teen driver rated on your policy including the type of vehicle they drive, how it’s insured, where they live, and their driving record. After we cover those topics, we’ll show you some ways to save money when insuring a teen driver. There will be a big price difference if your teen is driving a newer, more expensive vehicle than if they inherit a 20-year-old sedan from the grandparents. As parents, we try to balance affordability with safety, as not everyone can afford a newer vehicle, but we also want to protect our children as much as possible if they do have an accident. Newer vehicles are more expensive to insure not only because they have a higher actual cash value, but also because more than likely they will require full coverage including comprehensive and collision insurance. The table below shows estimated car insurance rates for a variety of vehicles that a typical teenager may drive. As vehicles age, insurance prices drop due to the reduced payout insurance companies will have to make if the vehicle is totaled. This is known as the actual cash value. If the vehicle is not insured for physical damage coverage, then liability, medical or PIP, and uninsured/underinsured motorists are the coverages you will be buying. For teens and even college-aged kids, it’s hard to justify buying a nice vehicle knowing they will be sitting (and getting door dinged) in parking lots for most of the foreseeable future. That’s why a liability-only policy makes a lot of sense and can save mom and dad a lot of money. Liability insurance will be expensive regardless of the vehicle they drive, but adding comprehensive and especially collision coverage will really inflate the rates. Teenage drivers, especially newly-licensed ones, have the highest rate of accidents of any age group. Collision insurance pays to repair your vehicle if it overturns or impacts with another object or vehicle, and the chances of having this type of claim are very high with a teen driver. They don’t always check their rear-view mirror or have the same depth perception as an experienced driver, and this contributes to many parking lot fender benders. If your budget is the biggest concern, vehicles in the 10 to 15-year-old range are a sweet spot for teen drivers. Most vehicles will still have safety features like anti-lock brakes and air bags, but the actual cash value has depreciated to the point where full coverage is not needed. The table below shows estimated rates for different full coverage and liability-only scenarios, for a 16-year-old driver. For this example, the rated vehicle is a 2010 Honda Accord. It’s easy to see why either having high deductibles or eliminating full coverage altogether is an attractive option. A high deductible can save over $1,000 a year, while dropping comprehensive and collision insurance can save as much as $2,300 a year. Insurance for a teenager is expensive enough even with a perfect driving record. But since teens are inexperienced drivers, speeding tickets, running stop signs, failure to yield, and other minor traffic citations are common. And if they cause an accident, chances are they’ll get a double whammy with both a citation and an at-fault accident blemish on their driving record. If your child does happen to get a citation or two, prepare for more sticker shock. Depending on your insurance company, the first ticket may not impact rates as much as you might think. But add a second citation or an accident, and you can expect to see a large double digit rate increase. The table below shows how accidents and violations can impact the price of insurance for young drivers. Chances are good that even before you get to the point where you teen has three violations and an at-fault accident, you’ve already received notification from your insurance company that he or she needs to be removed from the policy and placed into a high-risk or ‘non-standard’ policy. Many of the major car insurers will not even insure an older driver with that flawed of a driving record, much less a 16-year-old. Where you live is a large factor that determines the cost of coverage. Some states like North Carolina, Virginia, Indiana, Illinois, and Ohio have relatively cheap car insurance. Other states like Michigan, New York, Louisiana, Nevada, and Connecticut tend to have higher rates. And even within any particular state, rates can vary considerably if you live in a rural area as compared to a highly populated metro area. Mother nature also has a big say in auto insurance prices, as areas that are prone to hail or flooding will have higher rates that areas that are not subjected to the forces of nature. The table below shows estimated car insurance prices for a 16-year-old driver for both full coverage and liability-only in all 50 U.S. states. Again, we are using a 2010 Honda Accord as the example rated vehicle with $500 deductibles for the full coverage rates. The cost to insure a 16-year-old ranges from a low in the state of Maine at $2,956 a year to a high of $7,938 in Michigan, a difference of $4,982. That’s a heck of a difference considering the driver risk and vehicle coverages are identical. Michigan is a no-fault state and has notoriously high car insurance rates. No matter how you spin it, car insurance for young drivers is going to be expensive. Their lack of driving experience and inattentiveness behind the wheel is responsible for earning them the distinction of the highest car insurance rates. There are ways to help lower rates, however, and here are the top ways to control costs. If you found out how much it’s going to cost to insure your 16-year-old and your jaw dropped, it might be a good time to shop around. Comparing insurance rates should be a regular habit, and since it doesn’t cost anything to get a quote, it could be time well spent.